A couple of summers ago my seven year old granddaughter was a bit bored on a camping trip. We went to the Ben Franklin general store in a small town nearby and she picked out a little doll quilt kit. She had never stitched a stitch before and I was amazed how quickly she caught on. Pictured above is the doll quilt she made. Later she made the little whole cloth quilt shown to the right. 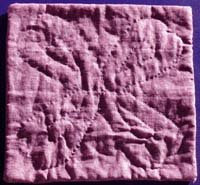 History tells us that some young girls enjoyed being just like their mother by making a quilt. Others hated being forced to finish one more row of stitches before being allowed to go out to play. But since knowing how to sew was a necessary skill for women through most of American history it was important that each little girl learn. 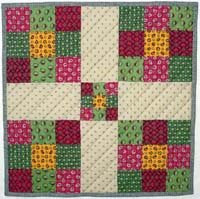 Most clothing was made by the womenfolk and by the middle of the nineteenth century many made quilts as well. 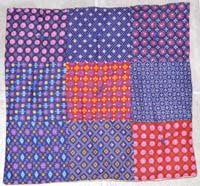 Making a simple quilt of squares in a one, four or nine patch pattern was a good way for a child to get started quilting. I have a free pattern for a nine patch doll or baby quilt at Nine Patch Quilt Patterns for Babies and Dolls. You might enjoy using it to teach a child how to make a quilt.